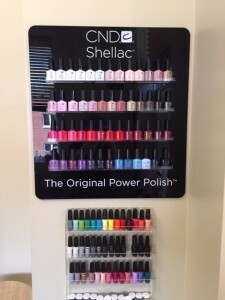 CND Shellac, the original gel-polish hybrid, turns 5 years old this month and we have been using Shellac since it debuted at a show in Las Vegas. In fact, when we learned about this revolutionary new product, I bought a plane ticket to Vegas so I could be among the first to purchase it and bring it back to Iowa! Our nail technician and esthetician Cassandra recently took an advanced CND Shellac course where she learned new techniques, tips, and tricks and learned about the soon-to-debut new top coat and lamp. 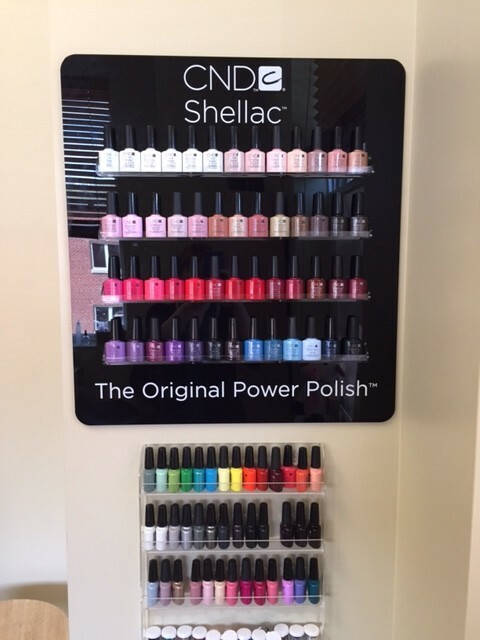 The new CND Shellac Top Coat will be available soon and will make removal even faster and gentler! 5: Every CND Shellac Color is individually formulated to create the best color, which explains why some are thicker or thinner, and some hold foils better than others. 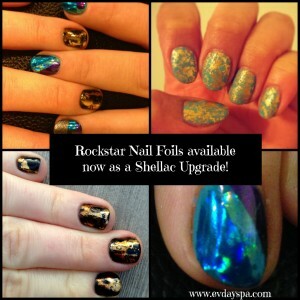 Add some fun to your Shellac with a foil upgrade on all or part of your nails. 4: CND’s new LED lamp has been in development for THREE YEARS! 2: On average, fingernails grow just 3 mm/month. In our experience, keeping a hard gel polish like Shellac on, can help keep you from biting or breaking your nails! 5. We need to know what products to use. If you are booking a facial, our estheticians have many options for cleansers, toners, masks, scrubs, moisturizers, serums and more. 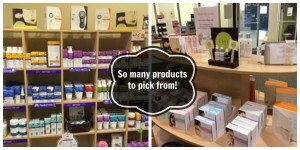 The information on your skin care intake in addition to their assessment of your skin guides their choices. If you are investing time and money in your facial, you deserve a wonderful service customized for you. If you are scheduling a massage, we need to know if you have any allergies or sensitivities so we can select the best massage cream or oil. 4. We might need to modify a service based on health concerns or preferences. Certain medications require a change in pressure or technique due to a risk of bruising or tissue damage. For example, some medications make skin more sensitive to waxing and can cause skin tears. Some health conditions contradict exposure to heat so we might suggest changing your Hot Stone massage to a Sports or Signature service so as not to to exacerbate symptoms or cause burns. Some symptoms might seem harmless, but could indicate a serious problem like an infection or blood clot requiring medical attention. 3. We need to know which techniques to use. There are literally hundreds of styles of massage therapy. Many of our therapists have over 1000 hours of initial training and are required to take continuing education regularly, so our technique “tool boxes” are far bigger than what you can tell by looking at our brochure. Letting your therapist know injuries you have, areas of pain, and pressure preferences will make a world of difference in the effectiveness of your service. Just because you had a light and relaxing massage with a therapist once, doesn’t mean he or she isn’t able to give a good injury-specific focused treatment another visit or visa versa. You just have to let us know exactly what you need so we can raid our massage “tool box” for the best techniques to for you. 2. Some of your answers clue us in to ways we can go above and beyond for you! Have allergies or a headache? We can add a cold compress to your face rest to help relieve the pressure. Work long hours standing on a cement floor? We an add a cooling mint foot cream instead of the regular massage cream. Under an incredible amount of stress and struggling to calm your mind before your massage? Your therapist can add a couple of drops of lavender oil into your massage cream and have you do some breathing exercises. We can even re-position to an incline or side-lying position for recent abdominal surgeries or breast tenderness. The possibilities are endless, but we can’t help you if we don’t know what you need our help with! 1. Your current concerns may be caused by issues you wouldn’t have suspected. A thorough intake could lead to underlying causes of current issues you may not have thought of. An old surgery or injury may be contributing to current pain in a completely different area of the body. Your current skincare regimen could have unintended side-effects you didn’t know about that could be causing dry patches or clogged pores. Your favorite hobbies may be taking a toll on your body over time. All of this information will help us to provide the best results possible for a better treatment value. If we don’t have the information we need, your service provider will need to take time out of your treatment to ask questions and you won’t be able to relax as fully. If you come a few minutes early to complete your form, it will give you a time to decompress and shake off the day, relax with some hot tea or water, and focus on your treatment goals so you can be sure you are getting the best value for your time spent at the spa and a the best service and recommendations from your expert provider. Are your products doing what you THINK they are? We all want to get a great value, but I’m amazed by how many friends, family members, and clients are not getting the results they should from certain products or treatments, but are reluctant to change. Here are a few I’ve caught recently. I’ve really been re-thinking a few of my own product choices lately too. I’d love to hear your thoughts! I read an article online recently quoting a dermatologist who recommends sunscreen only as opposed to facial moisturizers that include sunscreens. It made really good sense, actually. I had always felt fine knowing that my beloved Derma E BB Creme has SPF 25. BUT…the dermatologist argued that for sunscreens to work, they have to be applied liberally to the skin. I only dot the BB Creme where I need help evening my skin tone. Many people who use moisturizers with SPF only dot them where needed and certainly don’t apply heavily under make-up. This is fine for walking from Gong Fu to the spa, but not for prolonged sun exposure. I need to invest in Derma E’s facial sun screen in addition! For dry skin on the hands, hand cream is a must, but most lotions are too heavy to do much to help dry cuticles and peeling nails because the molecules are too big to be effective. A cuticle oil with smaller molecules is more appropriate as it will absorb quicker to moisturize dry cuticles can even penetrate through nail polish to hydrate nails underneath. Clients who complain that their Shellac chips after a few days of wear but refuse to use an oil designed for cuticles that can penetrate through gel polishes because they believe their thick hand cream can do it all won’t get the results they want. Fortunately, a mini bottle of Solar Oil is less than $3 and will help keep nails from peeling underneath Shellac and will work wonders on dry cuticles and overall nail appearance. Partner the cuticle oil WITH your favorite hand cream for the rest of your skin, you’ll be looking like a hand model in no time. You only need to exfoliate 1-2x/week with a good exfoliation product like Derma E’s Microdermabrasion Scrub. Daily cleansers with plastic beads are not doing enough to exfoliate, some drug store scrubs that are promoted for daily use are far too harsh due to the jagged edges of the abrasive ingredient. Even a good quality exfoliation product should not be used more than twice weekly. Many people mistakenly believe that metal blades to shave or scrape calluses are the most effective way to remove them, but in reality, these harsh tools actually can damage skin leading to scarring and harder calluses as the skin works to repair itself. In many states, including Iowa, Credo Blades (metal callus razors) are illegal in nail salons so if you see one, RUN! If you have hard calluses that are bothering you, the safest way to soften them is to use a gentle foot file like the ones we give you during your pedicures at the spa regularly in the shower, but not TOO aggressively. Products like Farmhouse Fresh Honey Heel Glaze can also gently soften calluses. Our calluses do serve a purpose in protecting our feet, especially for runners, walkers, and people who like to wear sandals or walk barefoot, so it is important to leave some callus! We are total advocates for baths with Kneipp aromatherapy salts or Epsom Salts (even the drugstore epsom salts!) but you can get too much of a good thing. Some people mistakenly believe that salt baths soften the skin, but in truth, they can be quite drying, especially when combined with the hot water. If you take baths regularly, either add a softening agent to the bath in addition to your salt like a light bath oil (almond or jojoba) or the Kneipp Skin Soft Almond Bath, or be sure to rinse the salts off briefly after a soak and apply a good moisturizer.